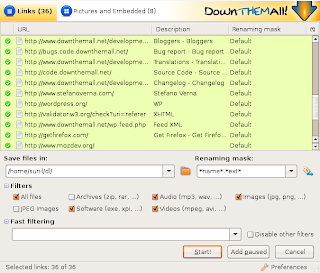 If you are using firefox to do internet browsing, DownthemAll is a cool plugin. You install it from here. Once installed , this plugin adds two items to your right click menu. Look at the following picture. When browsing a web page you can right click and then select the Down them All button. A new window pops up as shown below. Set up the target diectory and then select the files/URLs to download. Enjoy easy download. I you want the list of packages along with the disk space they occupy use this variation. This can be very useful if you install lot of packages and later decide to remove some of them to recover space. Adblock is a firefox extension which can save lot of internet traffic for you. Don't forget to install it if you have a monthly download limit. This video shows how to install it. Dissy is a small utility which can be used to disassemble executable programs. It is actually a front end to objdump. 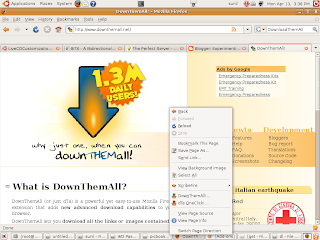 On ubuntu objdump is provided by the binutils package. For trying out dissy, write a small C program as below. You will get a graphical screen as below. 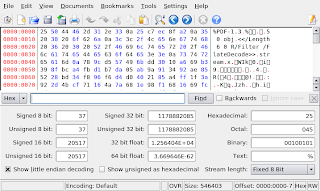 Ghex is a cool hex editor that I some times use. You can install ghex like this. Here is a screen shot of Ghex. Alternately, you can install khexedit. 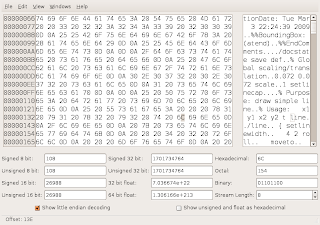 Screen shots of khexedit are shown below.